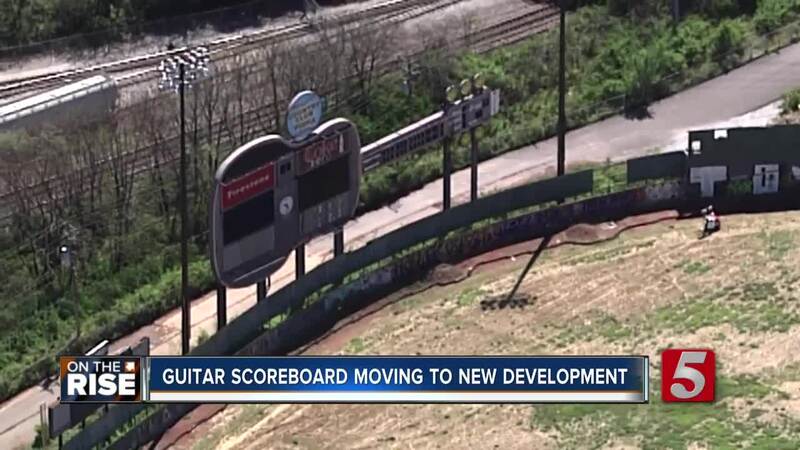 The iconic guitar scoreboard from Greer Stadium will be moving to a new home, just a few blocks away, after a developer purchased the scoreboard with plans to integrate it into their newest project. NASHVILLE, Tenn. — The area south of downtown Nashville is changing. Wedgewood-Houston, Chestnut Hill, and other neighborhoods are having empty lots filled, old buildings replaced with new buildings, and plenty of new businesses moving in. As a city on the rise, Nashville has to balance preserving history with bringing in new development, and a new project is doing just that. According to the Nashville Business Journal, Chicago developer AJ Capital Partners, which co-created the Thompson Hotel in the Gulch, is building a second project in Wedgewood-Houston called Nashville Warehouse Co. The project, located on 5.2 acres at the corner of 4th and Chestnut, will feature more than 300 apartments, 200,000 square feet of office space, retail and restaurant space, and an outdoor green space/live-music venue anchored by the Greer Stadium guitar scoreboard. The scoreboard was put up for sale by the city with a minimum bidding price just below $55,000, and that’s what the developer paid, according to the Nashville Business Journal. The property looks to also feature a water tower, according to the renderings, which has led some to believe that the developer would preserve the water tower currently on the unused property. “I really like the idea that they’re preserving the history. This whole neighborhood has got a really great, outstanding history,” Doug Havron of Gabby’s Burgers & Fries said. Havron has run Gabby’s for more than 10 years, just past Greer Stadium’s outfield, and he said he’s glad that the scoreboard will not only be saved, but will remain in the neighborhood. The stadium itself is expected to be turned into a park and green space, while the new Nashville Warehouse Co. is expected to have construction started in September.